IBM's Rational Software division has once again selected Elguji's IdeaJam Cloud for their "VoiCE Jam". The Voice Jam (https://voicejam.ideajam.net) will commence on December 3rd, and run through December 13th. Pre-registration is now open. IdeaJam is powered by IBM's Domino server technology. Join us for this free demonar (webinar) on Tuesday, December 4th, at 1:00 PM EST (GMT - 5). Learn how other companies are using IdeaJam with their employees, customers and partners. See how they customized and configured IdeaJam to meet their specific challenges and see how easy IdeaJam is to quickly get up and running in your organization. We will also show you can integrate IdeaJam with your applications using the extensive IdeaJam programming API. "I have known Ryan for a number of years now and have worked closely with him in the Lotus Notes/Domino spectrum. He balances a level of professionalism with a laid back flair that draws people in. He continuously drives for innovation and believes passionately in loyalty, dedication, and being first and foremost - genuine. He strives on building solutions, and has built his success based on that straightforward approach to business. It has been a privilege to have worked with him over the years and I look forward to many more. - Michelle Mann"
Centric Fusion have successfully built and managed a global network of authorized resellers, led product launches and built a brand over 10 years for a manufacturer in the industry. Centric Fusion’s approach is built on providing valued advice and premium options with senior level insight at no additional cost. Centric Fusion is not a “consulting” company who is looking to offer additional services at a cost or to promote their own products. Centric is your dedicated resource in lean times, your extra resource on your project team, as they understand that everyone is short staffed these days. Centric Fusion will assess the best options for your needs, in an efficient manner and allow you, as the customer, to decide which product is best suited for your environment. They are always pleased to share their expertise and insights based on available information at no additional cost. Centric Fusion provides you with options to leverage this “know-how”, with access to a broad range of solutions. Centric Fusion will help you and your organization to identify potential solutions, evaluate options and make the right choice the first time around. IBM's Rational Software division in cooperation with IBM's developerWorks has selected Elguji's IdeaJam Cloud for their "Jazz Plan Jam". The Plan Jam (https://jazz.ideajam.net) will commence on May 30th, and run through June 6th. Pre-registration is now open. Well then, I’m happy to announce our first ever Jazz Plan Jam, which begins on May 30. Together with our developerWorks colleagues, we’re trying something new as part of the planning for our next revision of our Jazz products. Normally we triage new requests, participate in conversations in work items, read the forums, interact with many of you in one-on-one conversations and through our client programs. Then, at the start of our planning cycle, we agree on the most important items that will make their way into our products. This year we’re supplementing the normal stuff by inviting you to an open, on-line Jam session. During the Jam, you can propose new ideas for improving our products and give a thumbs up or thumbs down to the ideas of others. Our hope is to learn not only what is most important to you, but also to spark your creative juices. We can’t promise to implement all of the ideas, but the Jam results will influence how we prioritize what we do next. IBM worked with Elguji to custom tailor the Plan Jam to meet their specific requirements as well as providing them with guidance and best practices for conducting "Idea Jams". Elguji has powered cloud based jams for Winn-Dixie, The USDA, The Department of Interior, Austin Independent School District, The Australian Goverment and many more. We are happy to announce that IdeaJam V1.9.1 is now available for download. Elguji customers with active maintenance and support agreements can download this version at http://elguji.com/download. The release notes for IdeaJam V1.9.1 are also available. We also have evaluation versions of IdeaJam V1.9.1 also available. Interested? Drop me an email or feel free to fill out this short form. GSX, which provides monitoring and management solutions for collaboration platforms, is in a rapidly evolving marketplace. Like most companies, core internal players had always provided the vision for GSX’s new product development. Given competitive pressures and customer needs, however, GSX sought a way to more rapidly and effectively iterate products based on customer input. GSX turned to a platform called IdeaJam, which was developed by Elugi using IBM Lotus® Domino® software. The platform provided an easy way for GSX to open up an ongoing dialogue with key customers about new product features and capabilities that are needed to address key business challenges. 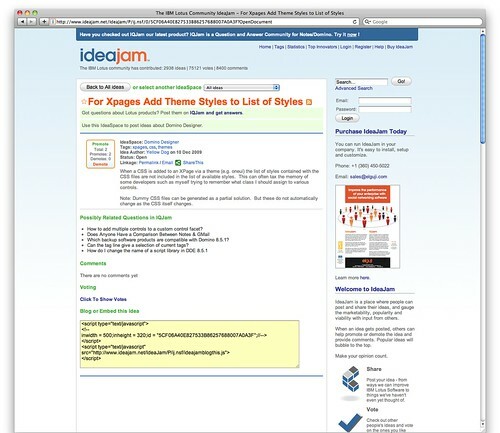 IdeaJam also integrates with IBM Connections software, so users can create custom portal pages, share profile information and more. Download the GSX IdeaJam case study and other IdeaJam case studies. Just a quick blog entry to let you know that we do offer 14 day trials of IdeaJam and IQJam. Every single feature is available for you to use. You can customize the way it looks, use it in Spanish, French, German or any other languages we offer, you can use the API, and much more. The only thing you don't get with the trial is access to the underlying database design. And if you decide to purchase either product you won't lose any of your test data. You simply get a new license key and access to the unlocked database template. Interested? Drop me an email or feel free to fill out this short form. Elguji is proud to annonce that BlueWave Technology is now an authorized IdeaJam reseller. "As customers strive to improve their business, they also strive to improve their methods of gathering the knowledge required. Bluewave is proud to resell IdeaJam as a forefront product encapsulating the true meaning ot doing business using social tools" says Paul Mooney, Senior Technical Architect at BlueWave. BlueWave Technology is an IBM Advanced Business Partner located in the UK. BlueWave is dedicated to providing services focused on IBM Lotus products. BlueWave aim to provide their customers access to the best possible skills and knowledge in this area. BlueWave Technology core areas of expertise are centred on providing technical knowledge to help businesses make the correct decisions. Using their network of contacts within IBM and the wider industry they provide strategic advice on product roadmaps, new developments and best practice. The range of consultancy services offered may encompass any of BlueWave's core skill areas including: Domino, Sametime, Quickplace, Lotus Notes mobility, load testing, proof of concept investigations, upgrades, consolidations, migrations, implementations, project management, Notes and web development, design and architecture. This video of IBM's Louis Richardson is a must watch and share with your friends and coworkers. Louis is also going to be giving the keynote speech at the "Social Connections" event taking place on 9th December 2011 at Cardiff University in central Cardiff, Wales. An IdeaJam can be switched into "read/view only mode" so that the audience can view ideas, votes and comments but are unable to create new content. An IdeaJam can be set to automatically switch into "read/view mode" on a specified date. The JSON API now supports JSONP which allows you to call the API from a different domain. When viewing an idea a new chart is available on an idea which shows recent activity against the idea including votes and comments. A new role which prohibits participants from creating ideas while allowing the to vote and comment. A new role which prohibits participants from creating comments. A new "Moderator" role which allows moderation of all idea spaces without giving them "full admin" rights. A new sidebar widget which displays the list of IdeaSpaces (categories) and their associated idea counts. XPages version upgraded to work with Domino 8.5.2+. Participant reputation scores and badges (gold, silver and bronze). Month names are now displayed in the local language when viewing ideas and comments. Support for multiple configurable static content pages has been added. Individual charts on the Statistics page can be enabled or disabled. The getTopInnovators API services provide the new Top Innovators banding in the response. "Networking applications such as LinkedIn, Lotus Notes, IdeaJam, and Twitter can tear down walls, but they can also create them: We’ve seen virtual-team members get so involved in their digital world that they become disengaged from the people right next to them." The JSON API now supports JSONP. When viewing an idea a new chart is available on an idea which shows recent activity against the idea including votes, comments and more. A new sidebar widget which displays the list of IdeaSpaces (categories) and idea counts. Sometimes you simply need to "un-cloud"
One thing we are seeing more and more of are customers who run their initial IdeaJam(s) in the cloud are deciding at some point to bring them in-house. Fortunately, this is very easy to do with IdeaJam. Our partners and professional services group can move cloud based IdeaJams running in our cloud based JamPot environment into a customers IT environment with ease. All this can be done with minimal disruption in service for customers. The inherent capabilities of the software technology that IdeaJam was built with give organizations a choice to "un-cloud" their IdeaJam(s) at any time. Many of the world's leading innovation management consultancies and global companies have been using IdeaJam as their ideation platform with their customers in the cloud using our "JamPot" IdeaJam manager. We are happy to announce that JamPot is now avaialable for companies and organizations wanting to run IdeaJam(s) on a month-to-month basis as a cloud service. JamPot allows complete control over creating and maintaining IdeaJams including user management and configuration. Pricing for JamPot starts at $899 (US)/month for up to 200 users, $1,199 (US)/month for 201-500 users, $1,499 (US)/month for 501-1000 users. For IdeaJams with more than 1,000 particpants discounted pricing is available. If you are interested in running an IdeaJam, whether it be for one month or an extended period of time, we would love to give you a tour. The Elguji website will soon be updated with more information on all of the great benefits running an IdeaJam with JamPot offers. We are happy to announce that we now have a Spanish language pack available for IdeaJam. Each IdeaJam user can choose to view IdeaJam in the language of their choice. Also, the administrator can set the default language of each IdeaJam to a language of their choice. IdeaJam now has language support for Italian, French, Spanish, German, Dutch/Flemish, English US and English GB. The Spanish language pack will be posted on our download site and will be included with the forthcoming IdeaJam V1.9. You can take the Spanish language pack for a test drive at http://ideajam.net. Go to the "My Profile" link and select "Spanish" in the drop down. IBM recently introduced the inclusion of "ideation blogs" in Connections 3.0.1. While this new feature is a nice addition to the Connections product it doesn't offer much more than adding a "promote" button to a blog entry. IdeaJam is complete ideation platform that is not only made to integrate with IBM Connections, it also can be usually be setup in a company within 30 minutes using their existing investment in Lotus Domino hardware and software. We put together this comparison sheet (PDF) to help companies learn more about IdeaJam and IBM Connections Ideation Blogs. These methods have several parameters that you can supply such as an IQSpace, an IQSPace and IQSubSpace a tag among others. My personal favorite is the "getExperts" method which provides a list of the IQJam participants who are answering questions correctly for a given IQSpace/IQSubSpace. Another one of my favorites that is being used by a customer is to supply help in the Microsoft Office sidebar for their custom Word, Excel and PowerPoint apps and templates. Clearly providing API's for customers in our products matters. How are you using our API's? Would you be more willing to purchase a product from a vendor if it included an API? Sometimes there are IdeaJam participants who don't want to be or shouldn't be included in the list of "Top Innovators". Let's look at how to do this. Recently a customer wanted to be able to hide the "Developers" link that appeared in the footer of every IdeaJam page. While most IdeaJam features can be turned on or off, there is not currently an option in the IdeaJam Control Panel for this. Enter the IdeaJam CSS document. Trust me, this is very easy to do. Save the CSS document and open IdeaJam from a web browser. The Developers link in the footer will no longer be visible. The second option is to tell IdeaJam on which date to enable "read mode". Read mode will prevent jammers from posting new ideas, comments and votes. The only thing you cannot do is to access the source code. The source code is included when you purchase IdeaJam Premier, Advanced or Standard editions. Interested in piloting IdeaJam? Please let us know. "Following" the IdeaSpace will send a periodic email digest with all of the newly created ideas. If you decide that you don't want to implement this feature in your IdeaJam(s) you can use the IdeaJam Control Panel to turn the feature on/off. You can also follow tags, individual ideas, comments and more. Oh, there's also the JSON and Web Services API to help you roll your own add-ons and extensions. In response to customer feedback we are introducing a new "Activity Chart" in IdeaJam V1.9. The chart appears on each idea page below the comments and votes and shows the number of daily votes and comments over the last 28 days. If your organization doesn't want to include the chart you can simply turn it off in the IdeaJam Control Panel. In addition we have also given customers the flexibility to determine which charts they want to have included on the Statistics page. Again, use the IdeaJam Control Panel to select the charts you want to include. So who are the Lotus communities top IdeaJam innovators? In IdeaJam V1.6 we introduced the "Top Innovators" feature. Each person contributing to an IdeaJam receives a score based on the number of ideas, comments, votes they cast and others who cast votes for their ideas. Each of these can be assigned a weight by the IdeaJam administrator. Additionally a Top Innovators calculation start date can be set in the IdeaJam Control Panel. Top Innovators has been an extremely popular feature with Elguji's customers. In the forthcoming release of IdeaJam (V1.9) we have expanded this feature to have three bands of scores - Gold, Silver and Bronze. The band thresholds are configured in the IdeaJam Control Panel. The band colors can also be modifying easily in the IdeaJam Cascading Style Sheet. Congratulations to Peter Presnell, Patrick Kwinten, Craig Wiseman, David Hablewitz, Vlad Sh, Cindy Kou, Michael Tassati and Mark Demicoli on achieving gold level Top Innovator scores. When customers purchase the on premises version of IdeaJam they can choose to run as many instances of IdeaJam as they need. New jams can be created with just a few clicks. Many of the companies that offer idea management software charge companies for each instance of their software. Another great benefit IdeaJam provides is that there is no additional cost to run IdeaJam on development, QA and clustered servers. One license covers them all. If you are thinking about social business, consider Elguji's IdeaJam idea management software. Social business starts with sharing and discussing ideas with others. IdeaJam can help thrust your company into the world of social business. Last week at IBM's Lotusphere 2011 conference Bruce Elgort was interviewed on the Product Showcase floor by IBM's Scott Laningham and "Turbo" Todd Watson. The interview was live-streamed on IBM TV during the show. Bruce talked about IdeaJam, IQJam, LinkJam, TSAzr for iPhone and much more. We thought we would give you a sneak peak at some of the great new features coming in version 1.9 of our IdeaJam idea management and innovation software. A new sidebar widget which displays the list of IdeaSpaces (categories). Participant reputation scores and badges. ISW is an Australian IBM Premier Partner that is 100% focused on delivering solutions on IBM technologies. As a full service provider ISW is certified across Lotus, WebSphere, Information Management, Rational, and Tivoli. ISW's team of software engineers work with Australian organisations, from small business to large enterprise, to improve their business processes and implement complex IT solutions involving IBM technologies. Recognised as one of Australia’s most technically qualified IBM Premier Business Partners, ISW are able to provide products and services that utilise the full range of IBM software as well as technologies that have been developed in-house by our own software engineers. ISW joins with Elguji as an IdeaJam reseller and are excited by the possibilities of combining their Lotus Domino, Lotus Connections and WebSphere Portal expertise with IdeaJam. IdeaJam will add another layer to the impressive capabilities of these popular IBM collaboration tools and, as Australia's leading Lotus Connections consultancy, will provide ISW with a further competitive differentiation in the market. Author Scott Burken presents a lecture about his book "The Myths of Innovation" at a Google Tech Talk back in May 2007. The video runs about an hour is an excellent watch. We would love to hear your thoughts about the video/book in the comments. Elguji was recently honored to have been included by Gartner in a recent comparison study of Idea Management solutions. In the research paper, "Who's Who in Innovation Management Technology," Gartner carefully examines eleven (11) different product offerings. While this research piece does not include the ubiquitous Gartner, "Magic Quadrant," table; it does include feature comparisons of over forty (40) features. The reader can easily walk away knowing IdeaJam has all of features they could possibly want (and then some). Additionally for those customers with an investment in IBM Lotus Notes & Domino, it's reinforces the simple notion that Domino is, "The Social Software Platform You Already Own." If you are interested in purchasing this research paper and / or becoming a Gartner client, please follow the link below. A big thank you to Gartner for taking the time to learn about Elguji and IdeaJam. Today we received a review of our IdeaJam Software-as-a-Service solution from Patricia Dabbert, Community Relations and Event Planning Coordinator at the Austin Independent School District. Pat was responsible for putting together the 72 hour "Education 2.0" crowdsourcing event held back in May, 2010. You can learn more about the districts Education 2.0 crowdsourcing success in this customer reference paper. The Austin ISD used IdeaJam to get input from a select group of students on various issues related to the school district's Strategic Plan. The IdeaJam software was extremely user friendly and the students caught on very quickly and enjoyed the ease at which they could generate and vote on ideas. As a customer, the staff provided outstanding customer service. They were always quick to respond to questions and were always available to provide assistance to make the IdeaJam run smoothly. I highly recommend IdeaJam to anyone wanting to use this type of tool to gather input from a group. Read Pat's and other customer reviews of Elguji's IdeaJam idea management software. Government 2.0 in Action: 20,000+ People Talking About "America's Great Outdoors"
In June 2010, the US Department of Interior (DOI) launched a Government 2.0 initiative called "America's Great Outdoors IdeaJam". This crowd sourcing initiative is centered around the key theme of "Your Ideas for Protecting the Places You Love" and is being used to collect ideas, comments and votes from citizens around the United States. For those not familiar with the term, "Government 2.0," it is used to define the creation of an online, comfortable, transparent, and cost effective interaction between government and citizens (G2C – government to citizens), government and business enterprises (G2B –government to business enterprises) and relationship between governments (G2G – inter-agency relationship). Government 2.0 is a mature market segment for Elguji. Government customers include the US Social Security Administration, the United States Department of Agriculture and the US National Information Technology Center. Challenges - What obstacles exist to achieving your goals for conservation, recreation, or reconnecting people to the outdoors? What Works - Please share your thoughts and ideas on effective strategies for conservation, recreation and reconnecting people to the outdoors. Federal Government Role - How can the federal government be a more effective partner in helping to achieve conservation, recreation or reconnecting people to the outdoors? Tools - What additional tools and resources would help your efforts be even more successful? There are three challenge topics that have been closed for input and have been archived. The results from these will be delivered to the America's Great Outdoors team for inclusion in the report to the President. There are now over 20,000 people participating in the IdeaJam who have collectively contributed 2,291 ideas with 10,277 comments who have cast 357,600 votes on these ideas. The "America's Great Outdoor IdeaJam is expected to run several more months. During that time it will generate many more ideas, comments and votes. All of which brings makes the government much more in tune with it constituencies. To learn how your state or local government municipality can benefit from a Government 2.0 initiative like the "America's Great Outdoors IdeaJam", please contact Elguji Software. IdeaJam now supports the linking of “multiple” ideas together and also allows ideas from other IdeaSpaces to be linked to one another. Previously you could only link a single idea to another idea. A set of 14 web services and JSON API’s (Application Programming Interfaces) that allow developers to easily interact and extend IdeaJam programmatically. More information on the IdeaJam API coming in another blog post. IdeaJam now provides Lotus Business Card integration which allows users to click on a persons name to see their Lotus Connections business card. This feature can be turned on or off by the IdeaJam Administrator. 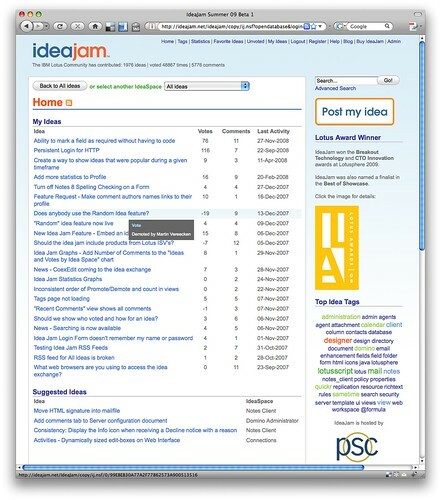 IdeaJam participants can now modify comments that they have entered in IdeaJam. Comments can be modified within fifteen minutes after they have been entered. IdeaSpace and IdeaJam Administrators can now moderate comments by either deleting or modifying them. The name of the person and date the comment was deleted is displayed where the comment was removed. When a comment has been modified the word “Modified” is added to the comment. New Top Innovators iWidget for Lotus Connections. New “Suggested Tags” feature makes it easy for participants to tag ideas. The “What’s Hot” list of ideas can now be selectively displayed in the side bar. Tag selection has been improved by using a drop down list of tags for a participant to select from. IdeaJam V1.8 is available immediately for download to all Elguji IdeaJam customers on software maintenance and can download IdeaJam here. Collecting ideas from employees on cutting costs. Soliciting feedback and suggestions from employees, partners and customers. Running innovation contests and competitions. Using the power of "crowd-sourcing" to rank ideas and allow the best ideas to rise to the top. Download the IdeaJam V1.8 New and Notable Features PDF. Back in May several hundred students from the Austin Independent School District participated in a district sponsored IdeaJam to share their ideas and thoughts in several key areas. The jam was held over a 72 hour period and included contributions from not only the students but the District Superintendent, Principals and other school Administrators. We just published a document which reviews the integration points that IdeaJam has with Lotus Connections. Lotus Connections can surface IdeaJam ideas using the IdeaJam Lotus Connections iWidget, a vast array of RSS feeds and via the Lotus Connections Business Card. These same features are also available for Microsoft Sharepoint. Today in the post we received a copy of Michael Sampsons new book "User Adoption Strategies" and were happy to see a section on Elguji's IdeaJam idea and innovation management software. This marks the second time IdeaJam has been covered in a published book. 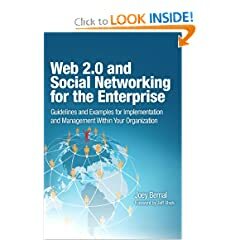 The first was in "Web 2.0 and Social Networking in the Enterprise" by Joey Bernal. Time to go read Michaels books. Stay tuned for our review. You can find some reviews of our IdeaJam product on the NotesAppStore.com. These reviews are from Elguji customers who run IdeaJam on their own Domino servers as well as from SaaS (with service) customers. Additionally you can read several case studies about IdeaJam here. Everyday, IBM Business Partners around the world strive to provide innovative solutions based on IBM products and services. The high number of Beacon Award submissions received this year significantly increased the level of competition. Today, I would like to extend my congratulations to you as being selected as a 2010 Finalist for the Outstanding Innovative Collaboration Solution Award sponsored by Lotus Software. Your nomination was among the best of hundreds received and sets the standard for business excellence, creativeness and client success. We would like to recognize you and all of the winners and finalists at this year's IBM Beacon Awards Recognition Event which will be held in Rome, Italy, May 18-20, in conjunction with IBM's Information on Demand Conference 2010. Award winners and finalists are invited to an exclusive Beacon Award Leadership Meeting, a series of exclusive, high-level education sessions, 1:1 meeting opportunities and special recognition events. So save the date and book your arrangements now! Attached is a complete description of the recognition event, finalist benefits, and directions on how to register. Thank you for submitting your nomination to this year’s Beacon Award competition. I look forward to meeting you in Rome. Elguji is extremely honored to have received this recognition from IBM. Elguji Software is not a big, anonymous corporate entity. We are a small team of dedicated and talented individuals united by the common passion of creating great software and providing our customers with first class customer support. To see a list of all of Elguji's awards please visit this page. There are thousands of unique staffing firms in the U.S. Differentiating yourself can be a daunting task. As a global workforce solutions company with over 8,000 full time employees and 700,000 contract employees, Kelly needed a global platform to generate ideas on improving the “experience” of their key stakeholders: customers, candidates, and workforce suppliers. Kelly invested in an on-line ideas & innovation management technology and benchmarked other companies on best practices in managing collaboration. Executive sponsors were enlisted to review and prioritize ideas in five key areas: customer experience; candidate experience; supplier experience; employee experience and cost savings. Named “IdeaHub”, the platform was launched on the company’s global intranet in December 2008. Kelly executives also inserted their own ideas to generate conversation and drive adoption. A team of moderators monitored and escalated ideas that generated over 100 votes and kept the company apprised of ideas that were being implemented. Executive messages also frequently included a link to IdeaHub so that the employees could immediately react by posting their ideas. Coming in the Summer '10 release of IdeaJam (due in May/June) we will be introducing the IdeaJam API. The API will be available via JSON and Web Services. 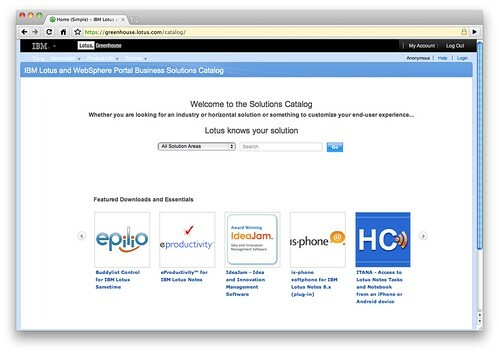 Using the API customers will be able to integrate IdeaJam into mobile applications, intranet applications, widgets, and other Lotus products including Websphere Portal, Lotus Connections and many others. You may remember this blog entry where we talked about our customers developing some really cool IQJam integration points with iPhone, Android and Microsoft Office. The API is still under development and if you have any feedback I am sure the development team would love to hear from you. If Enterprise 2.0 rests on delivering value through collaborative, emergent and social means, ideas are the top basis for leveraging these qualities. There are many types of content and activities – social objects – that are part of a social computing initiative. I’d argue ideas, for a host of reasons, should be considered top amongst those social objects. IQJam and LinkJam should be included in the catalog shortly. Elguji is now working with RSVP Consulting (www.rsvp-consulting.com) to support the development of service strategies within the UK Public Sector. We are bringing together strategy, change and innovation consultancy with Elguji's IdeaJam; idea and innovation management software offering - to deliver "more for less" to the UK Public Sector. This partnership is already paying dividends, over the last 3 months we have supported the development of an information strategy for two Primary Care Trusts (PCTs) within the UK's National Health Service (NHS). While the use of on-line engagement is relatively new within the public sector, this work engaged 150 management and clinical stakeholders, across multiple commissioning and provider organisations, to develop the strategy without the need for multiple workshops and meetings. This process enabled the PCTs to complete development work that would normally take months - within 8 weeks - more for less! Our work with RSVP will continue to support Innovative consulting propositions within the U.K. public sector - creating an environment where the public sector can collaborate to make informed decisions that support future service efficiencies. We're happy to be able to recommend RSVP Consulting if your organization is interested in using IdeaJam to develop new strategies or deliver innovation enabled business change, collaborating across boundaries and with partners - the team of Elguji and RSVP Consulting can help you. Since it's release in November 2009, the sales of our IQJam product are exceeding our pre-launch forecasts. Customers have been quick to deploy IBM Lotus Domino 8.5.1 servers and, with those deployments we are seeing our existing customer base, as well as many new customers purchasing and deploying IQJam. One of the key selling features of IQJam has been it's application programming interface (API). Customers have been linking IQJam to their server and support desk applications, Microsoft Office, to their company intranets as well as building some really slick Adobe Flex/Air applications. In version IQJam V1.1 we are addressing the top two feature requests that customers have asked for - those being Lotus Connections integration and adding attachments to answers. Elguji will be demonstrating IQJam V1.1 at Lotusphere 2010 at booth no. 622. Elguji's IdeaJam Named Twice as a Finalist in the 2010 Lotus Awards! For a complete list of industry awards Elguji has won you can look here. Congratulations to all of the 2010 Lotus Award Winners and Finalists. Part of Elguji's company strategy to help people developers learn more about IBM Lotus XPages development and to create brand awareness for Elguji included developing an open source application called TaskJam. With the thousands of TaskJam downloads have come inquiry after inquiry about other products - most of them leading to sales of IdeaJam, LinkJam and IQJam. How do we know this? Well people tell us! Additionally, we have acquired a cadre of XPages development work and consulting services as well. While Elguji is not the first company in the Lotus ISV/BP world to offer open source or free software to help drive sales of commercial software, we certainly can attest to it's success as a tool to help drive sales of our other products and services. We encourage other Lotus ISV's to follow suite as you can almost be guaranteed that it will help you drive sales and increase brand recognition. Some of you may be asking when TaskJam will make into the OpenNTF GPL Catalog and we can answer with "we are working hard on making that happen". A few days ago we blogged about the Lotus Knows Ad Campaign Case Study and, now we are happy to share the Case Study for the United States Department of Agriculture and how they used Elguji's IdeaJam product. During the economic downturn of 2008 President Obama challenged all US Government employees to make cost saving suggestions for the annual US Budget process. This was part of a larger effort to ensure that the US Government agencies invested taxpayer dollars in programs and initiatives that have proven records of success and fix or end programs that do not. The USDA needed to reach out to all of it's employees to find ways to reduce wasteful spending. Elguji has been witnessing company after company innovating with our products and, in particular IdeaJam. We have put together a series of case studies that are available on our web site. The first one we want to share with you is the Lotus Knows IdeaJam that took place in August 2009. Putting together public case studies is also a requirement for IBM Business Partners participating in the Business Partner Advisory Council which Elguji is a member of. IdeaJam is covered on pages 267-269. One of our Canadian customers in the financial services industry works with a web design and communications agency in Canada called iStudio. This agency is responsible for all of their web design work. When this company purchased IdeaJam they needed to customize it to match their corporate branding guidelines as well as the needs of the business unit interested in using IdeaJam. Using the native out-of-the-box functionality of IdeaJam, iStudio was able to make the customers IdeaJam look exactly the way the customer wanted it to look. Mike from iStudio recently blogged about how they used the language file to add a user agreement plugin to the login panel without touching the underlying Notes/Domino design. Elguji Software is very pleased to announce that IQJam, our question and answer community social networking software is now available for purchase. IQJam has been specifically built for IBM's Lotus Domino 8.5.1. Customer demand for an enterprise class question and answer system is the primary driver for Elguji developing IQJam. IQJam customers can also expect the same world-class customer service and support that they are accustomed to with Elguji. The demo schedule is practically booked solid so, if your company is interested in seeing a 30 minute demo please contact our Sales group. We would also like to thank the many customers who have participated in the beta program as well as the community members who helped test on the IQJam.net site. To learn more about IQJam please visit http://elguji.com/iqjam. Elguji Software is happy to announce that their forthcoming IQJam question and answer community social networking software is now available for beta testing at http://iqjam.net. IQJam has been specifically built for IBM's forthcoming Domino 8.5.1. Customer demand for an enterprise based question and answer system is the primary driver for Elguji developing the product. Users can login to IQJam using their IdeaJam.net username and password. An IdeaSpace for IQJam has been setup on the IdeaJam.net site for beta testers to enter their ideas on how to improve IQJam. Additionally, testers are encouraged to use the Feedback link at the bottom of every page to notify Elguji of any problems or errors they run into. IQSpaces and Sub IQSpaces for Lotus Sametime, Lotus Connections, Lotus Symphony, Lotus Quickr, OpenNTF, Domino Development, Lotusphere, Domino Administration, IdeaJam, IQJam, LinkJam and TaskJam have are available. The JSON and Web Services API is also available for testing. To learn more about the IQJam API visit the Developers link on IQJam.net. We'll be releasing more documentation about the APIs over the coming days and weeks, but if you have any questions, please just drop us a line using the Feedback form. All of the administration and configuration for IQJam is browser or Lotus Notes Client based which allows the administrator to choose how they want to run the site. Disclaimer: IBM Lotus Notes/Domino and Lotus Notes Traveler 8.5.1 is prerelease code and there are no guarantees from IBM that the functionality presented will be in the final shipping product. IdeaJam Fall '09 will be available for customers on software maintenance starting on September 26th. This release includes the ability to "Follow or Unfollow" IdeaSpaces (email alerts), the Top Innovators leaderboard, integration of the Dashboard with a users Profile, the ability to navigate back into a view where you left off and much more. - A tooltip now appears when hovering over the Favorite stars. - New Top Innovators function from the header menu. - Fixed language variables bug when withdrawing votes. - Fixed language variables bug when viewing a person's ideas on their profile. You can see IdeaJam Fall '09 in action at http://ideajam.net. VANCOUVER, WA – JUNE 9, 2009 – Elguji Software, LLC was named winner of the award for Innovative Collaboration Solution with Lotus® Software in the 2009 IBM Beacon Awards competition. Elguji’s IdeaJam software was awarded this prestigious award for delivering outstanding value and innovative approaches to helping clients address unique business challenges. The IBM Beacon Awards are an integral part of IBM’s PartnerWorld program, which provides industry recognition, increased visibility and promotional opportunities to IBM global Business Partners. Members of IBM PartnerWorld benefit from global marketing and technical enablement initiatives to drive new revenue and market opportunities through the delivery of innovative business solutions. The IBM Beacon Awards recognize excellence in the development and delivery of solutions and services that Business Partners deliver to clients around the world. More than 340 nominations were judged by a team of leading industry journalists, analysts and IBM executives, who selected winners and finalists in the 22 award categories. "IBM is dedicated to helping our global Business Partners deliver innovative solutions that enable our joint clients transform their business operations," said Rich Hume, general manager, IBM Global Business Partner Organization. "Elguji was recognized in the Innovative Collaboration Solution with Lotus® Software category based on their technology leadership and commitment to delivering customer value. This award is a testament to their commitment to delivering on IBM's smarter planet vision." For more information about the IBM Beacon Awards, including descriptions of the winning entries and details about the finalists, please visit http://www-1.ibm.com/partnerworld/pwhome.nsf/weblook/2009_awards.html. To learn more about IBM PartnerWorld, a comprehensive program that offers marketing and sales resources, training, certification and technical support to help create new revenue and market opportunities for IBM Business Partners, visit http://www.ibm.com/partnerworld. Elguji Software, LLC, is a member of IBM PartnerWorld located in Vancouver, Washington, USA. Elguji specializes in Web 2.0 and social networking software development. Visit http://www.elguji.com for more information. IBM and Lotus are trademarks of IBM Corporation in the United States, other countries, or both. IdeaJam is a trademark of Elguji Software, LLC. I fully admit that when I go to IdeaJam, sure I'll vote on some ideas and make comments, but what I am really interested in is what is happening with MY ideas. I want to know what new comments were posted on my ideas and which of my ideas are hot or not so hot since since last time I logged in. Bruce and company most likey have their own private admin views for this. Right? This will save us the time of having to click on all our ideas to see if any of the comments are new. Then we can spend less time being self-centered and more time being altruistic and contribute to the community. The top section will list your ideas, the number of votes, comments and the last activity date. If you hover over the title of an idea you will see a pop-up box which contains the last person who either voted or commented on your idea. The "Suggested Ideas" section will show you ideas that you may be interested in. We have developed an algorithm that suggests ideas based on your voting, commenting and tagging habbits. Spring '09 (V1.5) will be IdeaJam's fourth upgrade since it's launch in March 2008. All customers on software maintenance will be entitled to Spring '09. We will be pushing this build to the IdeaJam.net sometime in the next few days. Yesterday during the Lotusphere 2009 Opening General Session Lotus General Manager announced that Elguji was awarded the "2009 CTO Innovation Award" for IdeaJam. Bob also announced that IdeaJam was also a finalist for the "2009 Best in Showcase". "The CTO Award recognizes those visionary IBM Business Partners who are leading the technology charge by exploiting Lotus' and WebSphere Portals latest capabilities in innovative, leading-edge, and exciting new ways. These ground-breaking solutions are positioned to be drivers in tomorrow's new markets, fostering innovation and at an ingenuity level that stands out above their peers. Special consideration will be given to first-time nominees." Congratulations to Gayle Elgort and Matt White for working so hard to make IdeaJam what it is. "This Award will be presented to an IBM Business Partner who offers a solution that extends the software user experience by leveraging new technology innovations introduced into the IBM Lotus® and IBM WebSphere® Portal portfolio. These technologies must be new since Lotusphere® 2008, such as XPages, Live Text, Composite Application integration with the Sidebar, and the Portal Web 2.0 client. They provide IBM Business Partners and customers with the capability to integrate and blend heterogeneous applications and data in the context of the end user's role, transforming solutions into a single seamless work environment that boosts end user and organizational effectiveness. Submissions for this Award should be solutions that leverage these new technologies to extend business application functionality based on contexts defined by end consumer requirements. Entries will be judged based on the overall business value they demonstrate, the extent to which these solutions leverage the technologies, and the ability to demonstrate how these enhancements boost end user and organizational effectiveness. With Elguji's commitment to provide quarterly maintenance releases for our products we are happy to announce some of the features that will be available in the Winter '09 release of IdeaJam which will be available in the Lotusphere 2009 time frame. All of the new features in this release have come from our customers. As we like to say "we use our product to build and enhance our product". IBM Lotus Domino XPages Support - For customers running the forthcoming release of IBM Lotus Domino 8.5 they can choose to run IdeaJam using XPages or classic Domino HTTP. Both ship in a single NTF. Custom IdeaSpace and System Messages - You can now provide custom text messages that appear below IdeaSpace names to assist users. These messages can be easily dismissed by the user. System administrators can create new messages where they have the option to force them to re-display to users who have dismissed them. Improved Tag Clouds - Tag clouds now appear on all pages. The XPages version tag cloud will show tags on an IdeaSpace by IdeaSpace basis. Is this the best way to describe a Notes/Domino application to Joe Six Pack? Have a look at this 00:02:06 video and tell us what you think. I bet you didn't know that your company can get a free 30 day on-line fully functional evaluation of IdeaJam or LinkJam. Evaluations are secure and can be provisioned on our servers quickly. If you are interested in an evaluation, please fill out our "Request Information" form on the Elguji website and somebody will contact you. And if you have not yet seen our product tour videos be sure and have a look. You can find the IdeaJam Product Tour here and the LinkJam Product Tour here. Users can now choose which language labels should be displayed. The default is still controlled from the Control Panel, but now users have the ability to choose from other languages you may choose to offer by editing their Profile. The upgrade from the IdeaJam Summer '08 takes about 5 minutes and is available to all IdeaJam and IdeaJam Express customers. IdeaJam V1.2 (and IdeaJam.net) now allow users to change their password. Additionally users can now see ideas that they have not yet voted for ("unvoted") on an IdeaSpace by IdeaSpace basis. On Wednesday, July 9th, 2008 V1.2 of IdeaJam will be available for download to all customers with maintenance and support agreements. An updated "Installation, Setup and Customization Guide" will also be available. Sherpa Software a leader in email management tools for IBM's Lotus Notes/Domino and Microsoft's Exchange Server has recently purchased Elguji's IdeaJam software. Sherpa will use IdeaJam to solicit ideas on how they can improve their products. I can't even begin to explain how simple this was to configure and get running. Our site was ready to go in honestly a matter of minutes. It's well designed and thought-out, plus it's a Notes database. Even some of our Microsoft guys have been impressed with the power of Domino. Now agreeing on some of the wording and fine-tuning of the site will take some time but the initial setup and ease of ongoing changes will make this an absolute breeze. Seventy eight of your ideas have now been completed and implemented in the shipping version of IdeaJam (V1.1.3). Many of these features have also been included in soon to be released LinkJam. It's pretty cool that we have been able to use the IdeaJam system to build and shape new versions of IdeaJam. We are now working on some customer success stories where you will be able learn how our customers are using IdeaJam to improve their products and services by becoming part of the conversation and willing to innovate based on it. It's always good when we can mark an idea as complete. Maureen commented on this idea today that the feature request has been added to the Designer 8.5 client. So keep the ideas coming, the developers are watching.